The centerpiece of any press line, the press itself, gets all the press, so to speak. Most of us probably are familiar with stamping-machine technology advancements and the advantages they bring, from the introduction of servo-driven units to the use of simulation to construct more robust presses to controls advances that allow for flexibility in speed, line integration and process-monitoring functions. But it all starts with the feed. Material must enter the press straight and true, and in synch with every other line component. If not, be prepared for scrap, lower quality and increased downtime, and their negative impacts on the bottom line. To be sure, coil feeding has evolved to deal with newer breeds of material, and the increasing needs of metalformers and their customers. To take stock of the evolution, MetalForming spoke with David Hui, senior manager-controls engineering for Colt Automation (www.coltauto.com), Mississauga, Ontario, Canada. Robust material demands robust equipment and new ways to route it through the press. 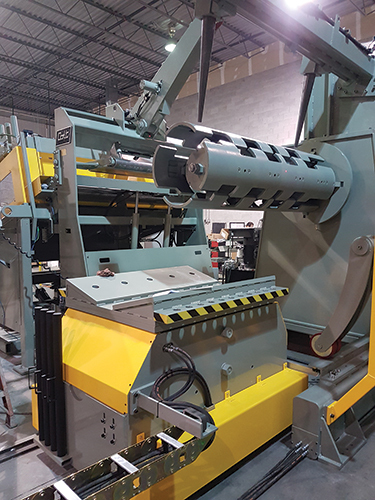 To handle heavy-gauge material, a power uncoiler with tension control, reinforced straightener and beefed up rolls, and a servo feeder with holding brake are must-have configurations. Absolute encoders accurately track rolls, guides and pass-line positions, and information in job recipes enable monitoring and control of position and other variables to keep machinery operating efficiently and effectively. Do not, Hui stresses, attempt to run higher-gauge material on feed equipment not rated for such use. For example, the tension created via an uncoiler with an air brake does not even approach the tension created by a 5-hp motor. A press line starts with the uncoiler. For tougher, thicker materials, a motor may be installed to assist with uncoiling. 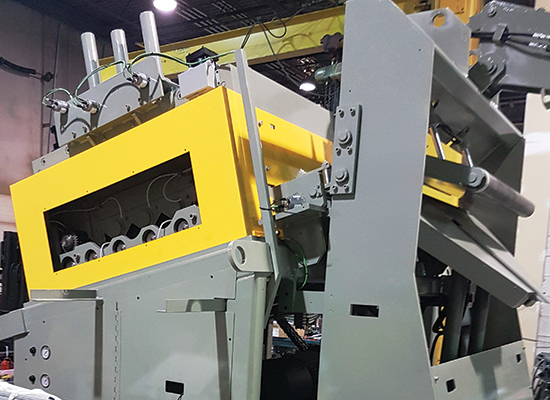 Powered uncoilers deliver synchronization with other press-line components, thus providing material feed at proper speeds without undue stress on feed-line components. Whereas feed equipment once could only handle higher- or lower-gauge material, on the scene today are systems that can feed both. Hui notes Colt-installed feed equipment that can adjust to material gauge ranges through the flick of a switch, which reconfigures the machinery. For heavy-gauge material, the uncoiler operates in tension mode and material is pulled off from the mandrel by pinch roll, while for light-gauge material, the uncoiler, in speed-control mode, offers less tension and the pinch roll is bypassed. With those words, Hui details how integration has improved and what it means for metalformers. The use of electronic-cam motion profiles to replace mechanical cams represent another advancement in line integration. This allows feed equipment to properly synch to the unique speed variations of servo presses. With high-speed communication (Siemens Profinet RT, for example) the press can share its master axis with the feeder and/or transfer line, ensuring synchronicity all the way through the press line. “So everything is cammed to the press, with every other line component following the press as a slave,” Hui explains. Job-recipe-driven feed lines offer the advantage of automatic coil loading. Think about buying or selling a used a car. A big selling point is ‘highway miles.’ Why? A car with more highway than city miles has not been subjected to as many starts and stops, which is consistent with driving in the city. That means less wear and tear on the frame and mechanical components. The same holds true for feed lines. Continuous-payout feed lines can interface with an analog loop sensor, and, as provided by Colt Automation, for example, control a straightener and/or an uncoiler to run at a constant speed equal to the throughput speed of the feeder, even with a shallow loop. Some feed lines offer simulation functions that can test the line apart from press operation to help ensure smooth material travel. In this day and age, no press-line discussion would be complete without mentioning the Internet of Things, or IoT. Smart technology extends to feed lines. See also: Colt Automation Ltd.